In light of the deaths of three children struck by trains this week (see article below) , We felt it was important to run this spotlight article on rail safety from our Safe Routes Scoop archives. There are over 1,000 miles of light and commuter rail and 2,463 miles of freight railroad crisscrossing New Jersey[i]. Tracks run throughout our state, in major cities, small towns, industrial areas and remote locations. 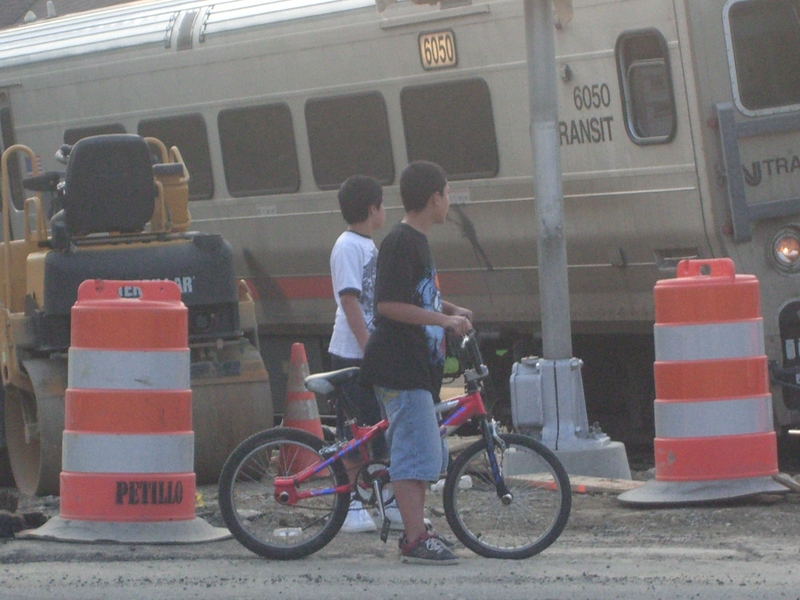 Many students cross rail tracks, both legally and illegally, each day while walking or bicycling to and from school. At approximately 500 per year nationally, deaths among trespassers on railroad rights-of-way make up the largest number of rail-related fatalities[ii]. Education can help prevent railroad deaths and injuries. Children need to be taught that they should never play on or near railroad tracks. SafetyYou should never try to cross the tracks if a train is coming. Because of their size, trains might look like they are moving slower than they actually are. By the time a locomotive engineer can see a person on the tracks, it is too late for him or her to stop the train from hitting them. Trains are very large and heavy and cannot stop quickly. A train going 55 mph can take a mile or more to stop – that’s about 20 football fields[i].The only safe place to cross tracks is at a designated public crossing with either a crossbuck, flashing red lights, or a gate. It is important to obey all signs and signals and to listen for a warning bell and train whistles. Once the lights begin to flash, it can take as little as 20 seconds for a train to travel through a crossing. This is not enough time to make it across. Even after the train has passed, continue to obey all signs and signals and do not cross until gates have lifted and the lights have stopped flashing. 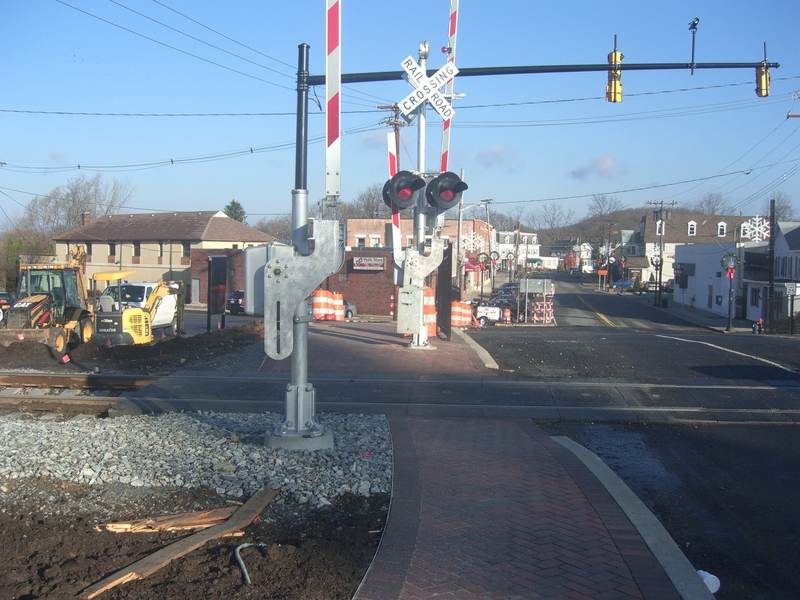 It is against New Jersey law to go around gates at a highway-rail grade crossing. This applies to everyone, whether in a car, on a bicycle or on foot[ii]. Crossing rail tracks on a bike can often be tricky, especially if the tracks cross the road at an angle. To cross safely, younger students should dismount and walk his or her bike across tracks. Older teens and adults may stay on their bikes but should check behind to see if it’s clear, and steer across the tracks slowly and at a right angle. This will help keep from getting a front wheel caught in the tracks. Bicyclists of all ages should be extra careful when rails are wet. Wet rails can be just as slick as ice to a bicycle tire. Legally, people can cross railroad crossing at public crossings such as roads, sidewalks, and trails. Trespassing deaths occur when a person crosses over a non-public railroad crossing and is struck by a train. People use railroad property to ride all-terrain vehicles and snowmobiles, to walk and bike, and to fish from bridges. People also take shortcuts across railroad tracks or property. Often these shortcuts are taken by students on their way to and from school. However, all railroad tracks, trestles, yards and equipment are private property and trespassers are subject to arrests and fines. In New Jersey, it is against the law to be on railroad tracks[iii]. People convicted of the offense of trespassing on railroad property are subject to a fine of not less than $100 and/or imprisonment[iv]. Every state has an Operation Lifesaver coordinator who can provide information about highway-rail grade crossing safety and trespass prevention activities, including scheduling a free safety presentation at your school, community club or workplace, or at fairs and special events. Operation Lifesaver also has trained and certified volunteer speakers who provide free safety presentations for various professions and for all age groups in order to increase public safety around railroad tracks. If you are interested in arranging a presentation, please visit Operation Lifesaver’s Web site at http://oli.org/about-us/contact/. This entry was posted in Bicycling, Education, Walking. Bookmark the permalink.